At Easter dinner, my brother mentioned relocating a book from childhood. As he intoned the title, I asked "Is that the one with the monkey's paw?" "You mean 'The Patchwork Monkey,' and yes..." he said. The Patchwork Monkey: the story that made me twitch a little in the presence of stuffed monkeys and patchwork stuffed animals of all stripe. The story that made me afraid to be alone, especially in the dark. How could I forget it? "Baleful Beasts and Eerie Creatures? I remember seeing that book around," my mom answered. My brother continued, "...and there was that story about the box." "Oh, the thing that gets loose in the house, and grows?" I queried. While my brother filled in the rest of the plot, my skin chilled as if cold wind swept suddenly through the dining room. I hated that book. It terrorized me, but I could not resist it. Over a long period of time, I read each story in the anthology. For the first time, I realized that it had also bothered my brother. He continued "Funny thing, do you know the year on the inscription?" Mutely, I shook my hood. The year he turned 5 and I turned 3. He could read well by 5. He could read aloud by 5. I doubt he read it to me at 3, but I suspect it was before First Grade. In my foggy memories of reading that first harrowing story, he looms large. It seems quite plausible that he played the role of narrator. Suddenly all those years (and I seriously mean years) of night terror suddenly seemed less mysterious. And it explained why I stuffed the unusually heavy hand-me-down patchwork dog in the back of my closet and NEVER wanted a sock monkey. The reemergence of Baleful Beasts touched a nerve in him. "Do you remember this other book? I'm SURE someone read it to us at [elementary school]. There was this hunter who shot a monster's tail off?" More childhood memories returned. Carefully tucking every inch of cover around myself (head included) after my mom left the room at night. Realizing in horror that my teddy bear fell from the bed to the floor and then crying because I was too scared to rescue her. The title of this terrifying tome? Tailypo. It's downright comical now. My dad and brother embarked to find both books online. 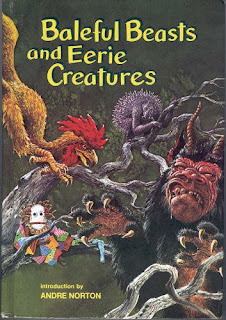 It turns out Baleful Beasts is a desirable collector's item and Tailypo's spooky illustrations aren't that much different than Farmer Brown from Click Clack Moo taking on an oversized dust bunny (on the other hand, Baleful Beasts' cover still creeps me out). When I walked in the computer room dad said "Baleful Beasts sells for $150." There was pride in his voice that he'd had the foresight to give my brother such a valuable book. My brother started reading me the Amazon reviews for Tailypo. It's amazing how many reviewers were traumatized by the book via elementary school teachers. 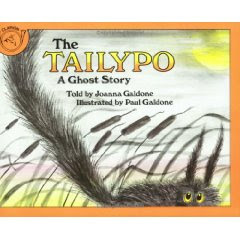 Lots of adults echoed his feelings about Tailypo: "Aside from teh [sic] mental scarring, I love this book." Next thing I knew I was reading all the comments for both books (especially Baleful Beasts). Seeing the readers' remarks I realized those texts were pretty powerful stuff for young kids and inspired more than a few nightmares worldwide. Though it hadn't been ordered before we left, I suspect a copy of Tailypo will soon be winging its way via parcel service (or flying monkey) to my brother. I made him promise not to show either book to Ranger or the Raptor until they are much older. So what scared the heck out of you as kid? How do you plan to handle similar materials with your own kids? The House with the Clock in its Walls (Bellairs). Scared the crap out of me, but I loved it. (And I'm definitely adding Baleful Beasts to my personal wishlist). Clowns. And my kids will be ok because I plan to avoid them for the rest of my life. The tale of the pale green pants with nobody in them. Dr. Seuss. From The Sneetches collection I think. Scared the bejesus out of me.